This movie is so absolutely hilarious, I think EVERYONE needs to go watch it on the big screen. Like seriously just go buy yourselves tickets and go catch We're The Millers! Thankfully for me, I got to watch it earlier all thanks to Nuffnang for the invitation to the #NNPremiereScreening of #WeReTheMillers! And now back to the actual review. Dealing with weed has always been illegal but a man's got to do what a man has to do and for David Clark, it's just that. Rose O' Reilly who lives in the same apartment doesn't have that much of a glamorous job either as she strips for a living, while Kenny Rossmore is an 18-year old...nerd. Casey Mathis on the other hand is a runaway from home and all together, they make the Millers. After all, this is simply a job to move a SMIDGE of weed from Mexico to the U.S and the Millers is nothing but a decoy created by David to aid in his smuggle. Jason Sudeikis plays David Clark / Miller in this movie and it is probably the first movie I've watched him play. I don't really remember if I've seen him before but he stands out okay in this movie. He's got the typical "I don't really care about life" kind of vibe but maybe that's how life really is for a drug dealer or anyone who really takes weed. I don't know, I'm against drugs unless it's prescribed medicine from doctors. I thought Sudeikis did a fairly good job at being Daddy Miller especially at the point of switching from Sir Drug-For-Everyone to the role he had to suddenly take on. His selfishness really grows onto you and you do feel like punching him but that's how a good actor does it, no? This picture shouldn't be here lolololol. This is a really inappropriate picture to be on a blog post but I thought it was so bloody amazing to see Jennifer Aniston still rocking a body like that at the age of 44. She rocked at being Stripper Rose but rocked more at being Mummy Rose! It was so believable yet hilarious when she tries to take away the stripper side in her while on the road trip to be a "mother-of-2" when approached by families on other RVs. She really hasn't changed from her F.R.I.E.N.D.S days and she still pulls off such funny acts in the most persuasive of ways. Super awesome. I checked on IMDB and this is Will Poulter. I then went on Google and realized that he's actually quite good looking but he looks absolutely weird in We're The Millers. Maybe it was on purpose but he's just about the cutest and most naive 18-year old character ever. My mother was so excited in the movie that she started calling Kenny (Poulter) stupid for ratting David (Sudeikis) out to be a drug dealer. It also turns out that Poulter once acted in Narnia which really explains why I thought he looked so familiar throughout the movie but I couldn't recall from where. Now I know and now I have one more guy up my to-drool-over list! I thought he did good but it could have been better and much more annoying. He is after all a naive virgin, right? 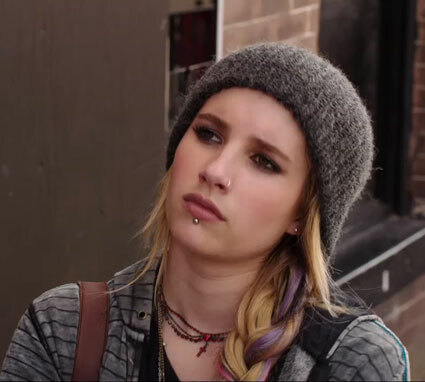 In case nobody already knows, this is Emma Roberts; the niece of Julia Roberts. (Pretty Woman anyone?) She has been in numerous movies and the best I remember her from is Wild Child. I think Roberts outdid herself with her change from a gothic runaway / lost cause to an innocent girl heading to college with some "extra credit" assignments. It was also really funny how she upholds being annoyed with everything to being soft and emotional towards to the end with the plus point being how my mum keeps saying, "She's very short ah. Very tiny." She is by the way quite tiny for a 22 year old although IMDB shows that she's just about my height. Must be the big screen effect. This movie by the end of the day is rightfully rated at 18 whatever because it's just complete with f-bombs all the way and there's the feisty / strippy scene from Aniston in between. I'm both shocked and glad that the Malaysian censorship board didn't come along and rip it off because it was so funny to have that in. It was overall a great movie to watch especially if you need some good laughs. It makes no sense, mind you but it really just tickles your bones to the max. I've put it at 8/10 on my personal scale for movies simply because I enjoyed it so much and my mum couldn't stop laughing. We're the Lam(s)...really doesn't sound right.